Simon Callow lecture on Orson Welles….. 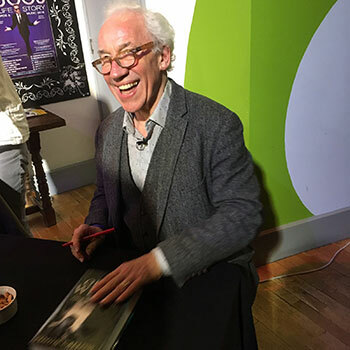 I was very fortunate to catch Simon Callow’s talk about his latest book at the Drill Hall in Lincoln last week. The second to last stop of his tour promoting ‘Orson Welles-One Man Band’ the third volume in a remarkable series about the enigmatic Welles and a truly revealing insight into the life of a man who I knew very little about. I would imagine that I am not alone in presuming that Welles was a huge Hollywood box office star but he wasn’t. A brilliantly clever man, a fine actor on stage and screen, director and writer, Welles’ life, as Callow pointed out, was divided into two parts; good luck and bad luck. Throughout the first half of his life, Welles was gifted wonderful, uncanny luck but it would not last and for such a revered man, the truth about his life in those later years is surprisingly sad. This is a tale of falling out of love and favour with Hollywood, creating an independent film company with near disastrous consequences, making serious advances in the early days of television whilst every so often producing works of genius. It is clear from the book and the preceding two volumes that Simon Callow has researched his subject of choice with great detail and enthusiasm. He travelled across Britain and the United States to interview anyone who had dealings with Welles personally or professionally and it shows in his talk. The combination of Callow’s acting ability, love of the stage and encyclopaedic knowledge of Welles’ life made for a fascinating evening and talk. Welles was a complex man and Callow deserves huge credit for his work on the subject. One cannot help but wonder who, in today’s show business world, would be deserving of similar study?